There are, however, a number of things that you have to keep in mind when it comes to online nursing schools. Depending on the qualification you choose to pursue and on the experience you already have you will either be able to study entirely online, or you will have to make certain campus visits. If it is your first nursing qualification and you are studying to be an LPN you will need to do clinical work which cannot be provided online, so campus visits will be required in that instance. The course structure will of course involve a lot of online work. Generally speaking the student will be able to access the course material online by logging on to the school’s website. Different schools may differ slightly in this regard, but in general it will work in a very structured manner with the lecturer in charge of the course posting notes and assignments on the website. In some cases interactive material such as video classes may also be used. Students will usually be able to log on whenever they have the time and work on the assignments and go through the work at their own pace. However depending on the structure of the course and the way the material is presented your lecturer may set specific due dates for assignments or may schedule discussion forums for certain times. The flexibility will therefore differ slightly from course to course, so this is something that is well worth asking about when you are deciding which course you would like to attend at which school. Whatever the case, it is very important that you submit all of your assignments in a timely manner as this is simply good manners and in some cases you may lose points for late submissions. The written examination for qualification will also probably take place online, although in some cases the school may require you to make time to do an additional onsite test in order to pass. There are a number of educational and admissions requirements that you will have to research and take into account before applying at a school. Before making the decision to enroll in an online program it is wise for you to ensure that your Internet connection speed is up to standard. Online schools that say that you will not have to do clinical coursework offline in order to qualify may well be bad choices as this is seldom a real possibility. Make sure that the school you plant to attend is properly accredited. If it is not you will essentially be wasting your time and your money. Do a careful search and examination of the school to ensure that it is a real school and not someone trying to con you. 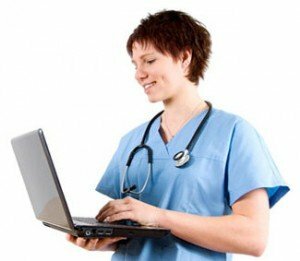 There are a few basic steps that you can follow in order to become a nurse through an online program. Once you have decided that an online school is the best choice for you, the first step is to start a search and look into all of the different online schools that are available. Look for one that meets your financial and academic needs. Make sure that you learn all of the requirements for the various programs before you make a final decision about which one to do. A program with a high density of clinical hours may be the better option as this will give you some good hands-on experience. Decide which of the specific qualifications mentioned in the previous section would be better for you to do. Remember that the more advanced the qualification is, the longer you will spend earning it. Have a good idea of how much time you will be able to dedicate to the course. This will make it easier for you to choose a course as they may differ slightly in terms of how much time you will have to devote on a daily basis to the online program. To complete your qualification you will most likely need to make arrangements at a clinical facility near to you to complete your practical hours. This is often your own responsibility when you do a course online and to save time it is probably better to look into this before you decide to enroll in a program. You will also need to look into your finances. Decide how much money you will be able to spend on the program and consider whether or not you will need financial aid options. There are a number of scholarships, grants, and affordable student loans that may be beneficial for you if you do not have the finances to pay for the school. These are considerations that you will have to keep in mind well before you actually begin applying at schools. Have a plan for payment. If you follow these basic steps you can’t really go wrong when it comes to earning your nursing qualification online. Below is a list of some of the basic requirements that you may have to meet in order to study online. The first thing that you will have to do is to fill out the necessary application. On this application you will have to indicate whether or not you have the necessary requirements. For most LPN programs, for example, you will need to have a high school diploma or GED at a bare minimum if you want to apply. It is also important that you include any previous experience you have in the healthcare field, whether it was formal or voluntary, on your application form as this can help your chances significantly. Most applications require an application fee. If you cannot afford the application fee there are options open to you. You could, for example, apply to the school for a waiver. You can also get financial aid to help you pay the application fee. Some schools do not have an application fee, so if you really can’t afford it you may have to limit yourself to those schools. One of the most important things you have to include in your application package is all of your official transcripts from previous schools and colleges that you have attended. This serves as proof that you meet the educational requirements that the school requires you to meet in order to accept you into their program. In some cases the school or schools that you are applying at will require you to take an entrance exam. This is something that will most likely cover your basic academic skills and usually does not require any knowledge of nursing. There is often a fee involved and you will have to attain a certain grade on the test in order to be accepted into the online nursing program. If you are going to have trouble paying for the school, you can send off the relevant financial aid forms at the same time that you send off your application forms for the school. This will speed up the process of getting the financial aid you need to study. Below is a list of some of your online nursing school options. These are the most popular schools with the best reputations and should therefore be considered on your list of potential schools to attend. Other options are also available but, as the schools work on an online basis, your location should not affect your ability to attend the schools listed below. A problem that a lot of people face, is knowing whether or not the online school they are interested in is in fact a genuine and safe option to choose. Unfortunately there are a number of schools out there that are in fact scams and the qualification that you earn from that school will not get you anywhere. There are a few important things that you can keep in mind to help you determine whether or not the school that you plan to attend is a genuine option or not. Firstly, it is better to attend an online school that also offers face-to-face offline classes. This will tell you that the school has an established reputation as a nursing school, and that there are actual people and actual premises to view if you want to. This goes a long way to giving the school credibility. In addition the transcript you are given will not necessarily specify that you studied online, and this can make a big difference to your chances of getting a job once you have graduated from the school. Look into how long the school has existed. The longer a school has been around, the higher the chances that it is a good option for you to choose. It will also look better on your resume if it is a well-established and well-known school. Luckily the field of nursing accepts online degrees in this day and age provided they are from an accredited school. This means that your options are wider in nursing than in several other fields. It may be better, however, to ask at your current or potential employer whether or not they accept online degrees and, if they do, from which schools? Sometimes employers have partnerships with online (and offline) LPN schools, so it is worth while looking into this and seeing what options your potential employer can offer you. Often employers will view you better if you have a bachelor’s degree from a traditional school and a graduate degree from an online school. Many employers accept employees with a bachelor’s from an online school, but your chances of employment will be slightly lower. If you have made it as far as an interview and your potential employer is skeptical of your online qualification, remind him or her that it takes a lot of self-discipline and motivation in order to study online. In addition it shows that you have excellent time management skills, something that will be required in your job as a nurse for that employer. In your resume as well as in the interview you can make your online qualification work for you by highlighting the skills that it taught you that will help you in your job. In most cases traditional schools will not provide you with these skills, so if you word it correctly you can make it work to your advantage. As you can see, there are several things that require your consideration when it comes to the topic of online nursing schools. When you make your decision about whether or not to attend an online school you should think about it carefully. Make comparisons between the schools you are interested in as well as all of the other options that are open to you in order to find the best online nursing colleges for you. Also be sure to consider offline options when making your comparisons. Some people simply function better in a classroom based situation because they need the structure and motivation that an offline class offers. Analyze your own abilities. Working online means that you will have to have a high degree of self-motivation in order to complete your work. You will also need to have good time management skills in order to fit the program into your schedule. If you do not have these skills, or if you suspect that you do not have these skills, perhaps you should consider an alternative method of getting your nursing qualification other than online nursing schools.